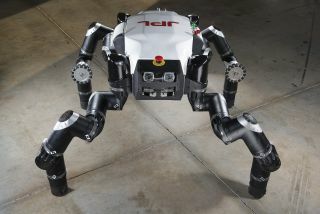 The Jet Propulsion Laboratory's official entry, RoboSimian, is seen in this image as it awaits the first event at the DARPA Robotics Challenge in December 2013. Also known as "Clyde," the robot is four-footed but can also stand on two feet. It has four general-purpose limbs and hands capable of mobility and manipulation. If you think robots need look like humans to be able to use human tools or rescue people in danger, then you don't know NASA's RoboSimian. Created by engineers at NASA's Jet Propulsion Laboratory (JPL) in Pasadena, Calif., RoboSimian is a strange four-legged machine that looks like an unholy cross between a spider and a chimp. The robot can walk on all fours, or fold in its hind legs and sit back on its wheeled haunches to wield its two dexterous arms. Sixteen teams from five different countries took part in the contest, and the robots were evaluated based on their performance in eight physical challenges. These included driving a vehicle through a designated course; traversing across uneven terrain and piles of rubble; removing debris from a doorway; climbing an industrial ladder; retrieving and connecting a hose; opening three different types of doors; using tools to cut through drywall; and closing a series of valves to demonstrate dexterity. Most teams opted to work with two-legged humanoid robots, but JPL was joined by a few other teams in experimenting with different robotic designs, which included machines on four or six legs, and even one that rolled around on tracks like a tank. Up close and personal with NASA's RoboSimian robot. The four-legged dexterous robot was built by NASA engineers at the agency's Jet Propulsion Laboratory to compete in the DARPA Robotics Challenge for disaster-response in December 2013. RoboSimian's unique design made some tasks more difficult than others — driving a vehicle, for one — but its long, sturdy arms and deft hands helped the robot pick up valuable points in activities such as clearing away debris and turning valves. The top eight teams that scored the most points at the Trials secured funding from DARPA, and will now move on to the Robotics Challenge Finals later this year. RoboSimian finished last month's event in fifth place, meaning the JPL team will have the chance to compete for the $2 million grand prize. A Japanese robotics team, called SCHAFT Inc., finished the Trials in first place. The DARPA Robotics Challenge was created in response to the 2011 Fukushima nuclear meltdown, in which a crippled Japanese nuclear plant leaked 300 tons of radioactive water into the ground after a devastating earthquake and tsunami struck the region. This image is a screengrab from a video showing Jet Propulsion Laboratory's RoboSimian turning a wheel at the DARPA Robotics Challenge in December 2013. "During the first 24 hours there, if [robots] had been able to go into the reactor buildings and vent the built-up gas that was accumulating inside the reactors, those explosions might have been prevented, and the disaster might not have been as severe," Gill Pratt, program manager of the DARPA Robotics Challenge, told reporters in a news briefing last month. "The tech we're trying to develop is to allow human beings and robots to work together, in environments that are too dangerous for human beings to go into themselves." And while the robots who participated in the Trials are a slow-moving bunch, Pratt expects the DARPA challenge will help advance the field of robotics. "DARPA has successfully used incentive-based Challenges over the past decade to attract innovators from around the world to develop leap-ahead technology capabilities," Pratt said. "The diverse participation in the DRC will reinforce the openness that the international science and technology community shares, and move us to a future in which capable disaster response robots can help us save lives and prevent loss."